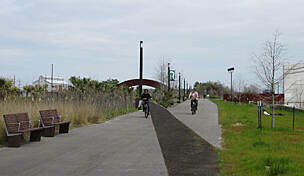 Louisiana’s first rail-trail, the Tammany Trace, lies to the north of New Orleans across Lake Pontchartrain and traces the old Illinois Central Railroad passageway across St. Tammany Parish. Linking historical lake and riverside communities, the Trace also serves as a wildlife conservation corridor. Through parks and wetlands, past bayous and streams, and over 31 original railroad trestles, the flat, asphalted 28-miles between Covington and Slidell offer an easy yet scenic and fascinating way to explore the cultural and natural heritage of Louisiana’s North Shore area. 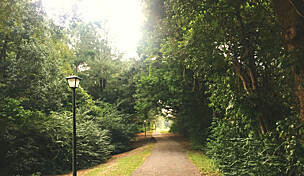 Loblolly pines, live oaks, and magnolias help create a canopy over much of the route to make it shaded and comfortable for summer-time recreation. With amble amenities, services and attractions available in the five communities along this multi-use trail, recreationalists can spend a day or several on the Trace. We offer a two-day round-trip itinerary beginning and ending at the western trail terminus in Covington. Visitors can arrive by air via the Louis Armstrong New Orleans International Airport. Bicycles are available for rent at Brooks Bike Shop , just a block from Covington’s trailhead. The Tammany Trace Foundation is a non-profit organization that helps raise funds for continued improvement and maintenance of the trail. You can visit their physical office in Mandeville or their virtual office to view a trail map and to remind yourself of good trail etiquette and specific Trace rules. Volunteer Trace Rangers are often on the trail and are there to help answer questions, to ensure the safety of all trail users and enforce the trail’s sunrise to sunset hours of operation. 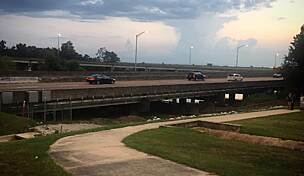 Covington, the parish county seat of St. Tammany, is located at the fork of the Bogue Falaya and Tchefuncte Rivers. 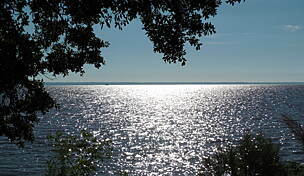 With the town’s founding in 1813, commerce began rolling through these parts via boats on the river and then on the railroad when it arrived some seventy-five years later. The Illinois Central rail line connected the Midwest to the Gulf Coast, serving New Orleans and neighboring communities for more than a hundred years. Today, it is evident that there are still plenty of opportunities for commerce when you visit Covington’s downtown. Galleries, boutiques, antique shops and restaurants line the historic streets. Put your bags and bikes away at either the Blue Willow or Camellia House Bed & Breakfast Inn, right across the street from one another and just blocks away from the Trace trail. First order of business might be to stroll to a Covington institution, H.J. Smith and Sons General Store and Museum, which has been around for a long time (circa 1876) and is a fun place to search through artifacts and curios that reflect the town’s past. There is also a museum worth exploring at the trailhead. If near the trailhead on a Wednesday during the growing season, you’ll be well-placed to enjoy the Covington Farmers Market and the fresh produce, light lunches, and live music on offer (the market is also held each Saturday at Covington City Hall). Thursdays evenings (April-October), the Rockin’ the Rails free concert series takes place at the trailhead as well. Nearly any time of the year, however, there is something interesting going on along the North Shore. Covington’s Three Rivers Arts Festival, a juried show of original works, is held annually in November. Of course, January through March is Mardi Gras time and Covington, along with its neighboring communities, participates in various festive (if not slightly raucous) Mardi Gras activities. Finally, if you are a beer-lover, you might as well start your Tammany Trace adventure at the Covington Brewhouse, a local brewery featuring German-style beers. It is just one of several such opportunities along the rail-trail to enjoy local flavor of the hops-kind. Before retiring for the night, check-out Del Porto, a restaurant around the corner from the B&Bs offering a unique menu featuring regional ingredients and one of the many excellent dining options in town. Begin the Trace from Covington's trailhead, designed to resemble an old-fashioned railroad station. 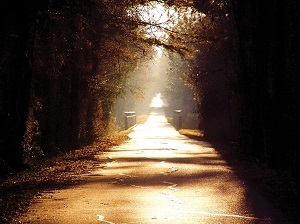 Heading east, the trail crosses the Tchefuncte and Abita Rivers into downtown Abita Springs, a 3.5-mile suburban route. 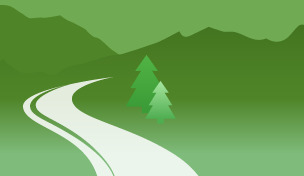 Expect numerous road crossings (as is the case for the majority of the trail). Shortly after crossing Abita River is the Abita trailhead with a water fountain and restroom facilities. Right across the street is the famed Abita Brewpub, a full-service restaurant housed in the original brewery; they serve a mean locally-brewed root beer in addition to their microbrews. If you have a penchant for folk objects that border on the eccentric or odd, visit the Abita Mystery House. 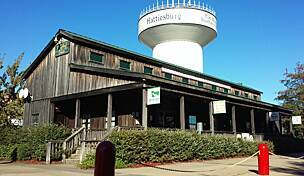 It’s a hard place to describe (as the name suggests) but one that is popular, nonetheless, and recognizable from the exterior as a vintage service station and old Creole cottage. 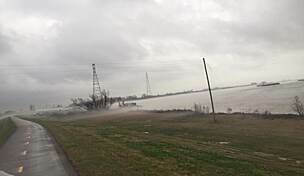 The trace takes a southerly turn out of Abita Springs and heads through residential neighborhoods to Mandeville and the northern edge of Lake Pontchartrain. About midway, there is the Tammany Trace headquarters and main trailhead where you’ll see a playground and a green caboose that is an information and ranger station (the trailhead in downtown Mandeville is 4.5 miles farther). If you’ve decided to tag on stopping along the Louisiana Brewery Trail as part of your Trace experience, look for Chafunkta Brewing Company just before the trailhead. You’ll want to spend some time in Mandeville(mile 12). Besides the chance to do more shopping and delicious Louisiana-cuisine tasting, you can stroll down the Mandeville Pier or spend some time fishing at several locations along the lake’s seawall. The Trace slices through the northeastern side of town, briefly merging with Villere Street for a short two-block stretch past the trailhead. You'll come within several blocks of Lake Pontchartrain as the route angles inland toward the bayou. At the trail’s bend, take Florida Street west to Liz’s Where Y’at Diner for a hearty meal from their full breakfast or lunch menu. If in town on a Saturday morning, stop at the trailhead to browse handmade items and sample a variety of local foods at Mandeville’s Community Market. You can’t miss The Old Rail Brewing Company either, right across from the trailhead. As early as the mid-1800s, Mandeville was a popular summer destination for wealthy New Orleanians seeking respite from the oppressive heat of the coastal plain; stately manor homes and majestic oak-lined streets give evidence to this era. Early jazz history was also made in Mandeville and historical venues, such as the Dew Drop Jazz & Social Hall, still exist today. Make sure you survive to tell the tale—keep watch for alligators, water moccasins and other creatures whom are best seen from a distance—as the trail leaves Mandeville southeast through the damp, heavy wetlands climate. This is the Louisiana of Deep South lore. 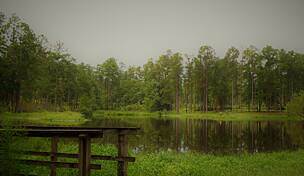 From the Mandeville Trailhead, you’ll arrive at the Fontainebleau State Park in just 3 miles. 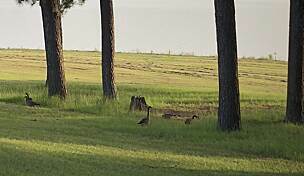 This 2,800-acre park has a visitor/nature center, nature and hiking trails, campsites and lodges and opportunities for boating, fishing and beach swimming. It is also the sight of the annual Mandeville Seafood Festival, a three-day seafood, live music and fireworks extravaganza. Next up is the small fishing village of Lacombe (mile 21). Bayous wiggle through and around this town like, well, a very large snake. The Big Branch Marsh National Wildlife Refuge lies between Lacombe and the lake, and one could spend countless hours exploring the Bayou Lacombe. There are lots of ways to do this, including a boardwalk trail— detour off of the Trace and head to the refuge’s visitor center (open Thursday through Saturday) to pick up a map of the area. Or, if you have quite a few extra hours to spare, let Bayou Adventure get you geared-up for kayaking, fishing or even camping (head left on N. 8th Street and right on Main Street). Another option is to take those extra hours and let the folks at La Provence (a block off of the trail 4 miles west of Bayou Adventure) sweep you away with their eclectic French-Creole fare. Photographs, paintings and antiques from Provence, France, (along with Rhone and Provencal wines) help to create an atmosphere that will likely put the bike miles far behind you. 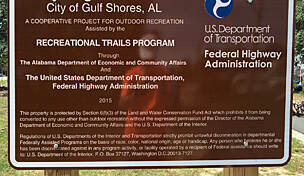 Seven miles from Lacombe is the Slidell Trailhead and the eastern terminus of the Tammany Trace. 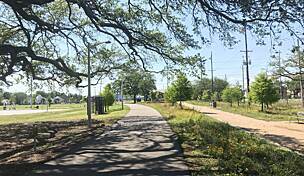 Plans are underway to extend the trail to downtown Slidell which is another 4.5 miles east. Until that time, however, we recommend turning around and retracing your steps back to Mandeville for the night. Mar Villa Guesthouse, just a block off of Lake Pontchartrain in old Mandeville, will wrap you up in the comfort of their verandah and fully restored 1870s guest house. A skip, jump and hop away is Nuvolari’s Ristorante, a popular neighborhood restaurant exploring Creole cuisine with an Italian twist, and The Barley Oak, an Old World Draught Haus with lovely lake views serving more than 100 different beers. Finish the evening with some live music and dancing at the rousing Ruby’s Roadhouse. Definitely don’t turn down a concert at the old Dew Drop jazz hall if you are lucky enough to be in town on a night when it is open for a performance. No need to rush onto the trail as your day’s destination is only 12 miles away. Take an early morning walk along the lake, stop at Another Broken Egg Café for breakfast and simply linger while taking in the sights, smells and tastes of Louisiana’s North Shore. 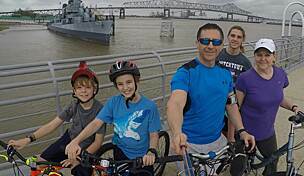 Enjoy a leisurely ride back to Covington and perhaps explore that which you may have missed yesterday.